A category about personal growth and influence. Including career management, personal branding, networking skills, lifelong learning, coaching and methods and practices to achieve significance. Successful people are self-confident. Confidence alone doesn’t make you successful, but it’s so important it’s worth studying in detail. Confidence has several ingredients – how we act, look, feel, what we say, and how we say it. Our body language, speech, and delivery influence people around us. Amy Cuddy taught the world how “Your Body Language Shapes Who You Are” in a TED speech watched more than twenty-million times. We convey a lot of information about ourselves, our status, and how we’re feeling through our posture, body language, and how we move to establish personal space. How do confident people act, walk, and talk? You know it when you see it. Let’s look at an effective teacher – the Military. Drill and ceremony rehearsals, confidence courses, the “gas chamber,” where Soldiers and Marines are inoculated against the fear of being hit with “tear gas” through the experience of being exposed to it. On demolition ranges where they learn how to throw live hand-grenades – safely. Airborne school, where Soldiers are turned into Paratroopers, and on countless missions, deployments and real emergencies that challenge participants to control their emotions to keep fear in check. Early in my Military Police career I witnessed how attitudes affected preparation, readiness, and performance. I watched a five foot three inch, hundred and ten pound women control her fear to subdue a violent man twice her size. Phrases I half-believed then I embrace completely now – “fake it till you make it”, “when in charge, take charge, and when you’re not, act as if you are.” Confidence is not a substitute for competence, but it trumps alternative ways to approach life. Training can be designed to teach tasks that together form skills that Soldiers or business-people master before they are qualified. Drown Proofing is a good example. It begins as a series of easy-to-achieve tasks. Soldiers are taught how to stay afloat and to make a flotation device from their clothing. The training culminates with a fully-clothed soldier, complete with kevlar vest, helmet, rifle, and boots thrown into the water. To pass, they need to stay afloat, no style points – as long as they don’t panic, they’ll get through it. And that’s true for anything you do in life – don’t panic. 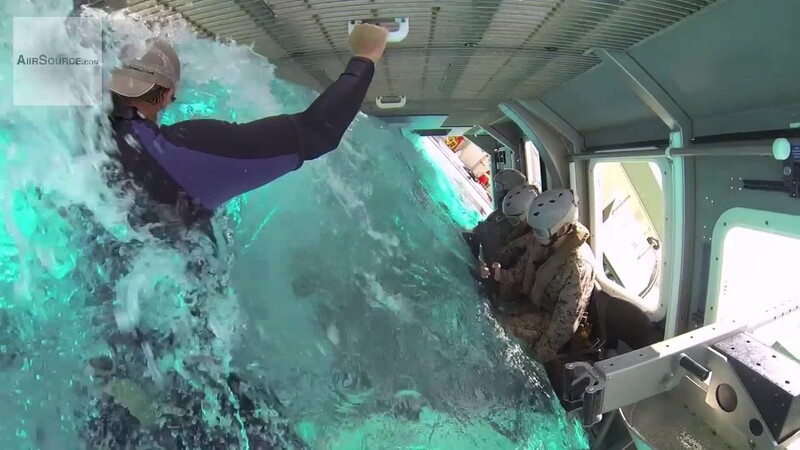 More dramatic than conventional drown-proofing, this image shows Marines inside a helicopter mock-up as it rotates into water – you can watch the entire video on youtube here. This specialized training increased the survival rate for helicopter passengers caught in a forced-landing on water by several hundred percent. Lessons learned in the Military can be applied to business. Networking is to business what drown-proofing is to Marines. Research on networking conducted at Harvard University adds evidence on this topic. People I work with don’t need to do more good things better, they need to stop doing one thing poorly or step-up in situations where senior leaders wouldn’t hesitate. Usually it’s a single self-defeating inaction, or belief that stops them from moving forward. Self-confidence is the most common element their focus can fix to achieve the results they want. Think about how this could apply to you. Gavin de Becker points out that young circus elephants are tied to a post with heavy chains they can’t break. Over time, they learn to stop trying, and eventually, as adults, they can be restrained with the flimsiest rope. What ropes are holding you back? Are you afraid, or lack confidence, or self-worth? Learn to be fearless. Please “Like” and share if you found this useful!